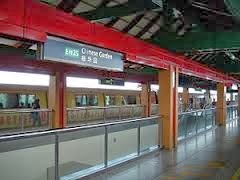 Chinese Garden MRT is located at 151, Boon Lay Way in Singapore 609959. This station serves the residents in Hong Kah and Yuhua, as well people seeing the various tourist attractions. Nearest MRT is Chinese Garden MRT and the closest bus interchange is Jurong East Bus Interchange. Amenities in the area include Jurong Entertainment Center, Taman Jurong Shopping Center and IMM. Some of the schools close by are Fuhua Primary School, Shuqun Secondary School and Yuhua Primary School.